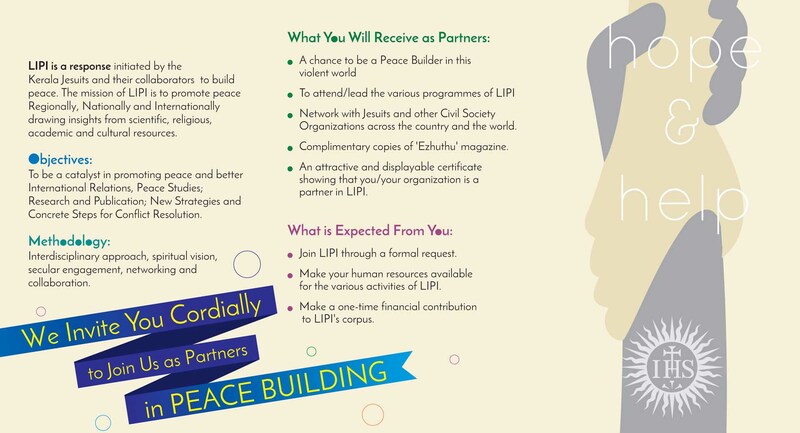 We see an organisation which aims at leadership in peace, justice and International relations…. Interdisciplinary approach, spiritual vision, secular engagement, networking and collaboration…. Loyola Institute of Peace and International relations was formally launched on November 1, 2015. On the auspicious day of the birth of the State of Kerala, a long-awaited dream of ours came to be realized. The Town Hall of Ernakulam packed to its full capacity with friends and well-wishers and more than 60 Jesuits witnessed the birth of the Peace Institute. An array of dignitaries like, Justice Kurien Joseph, Smt. Dhayabhai, the well-known activist, Provincial, Fr Dr.M.K. George, the Chief Editor Prof. V. G. Thampy, Prof. M.K. Sanu, Fr Adapur, and Prof. M. Thomas Mathew adorned the dais. The formal function began at 3.00 p.m. with a melodious and devotional invocation by the Teachers and students of the Department of Music, Sri Sankara University, Kalady. Dr. Binoy Pichalakkattu, the Director of the Institute, formally welcomed the gathering. Prof. V.G. 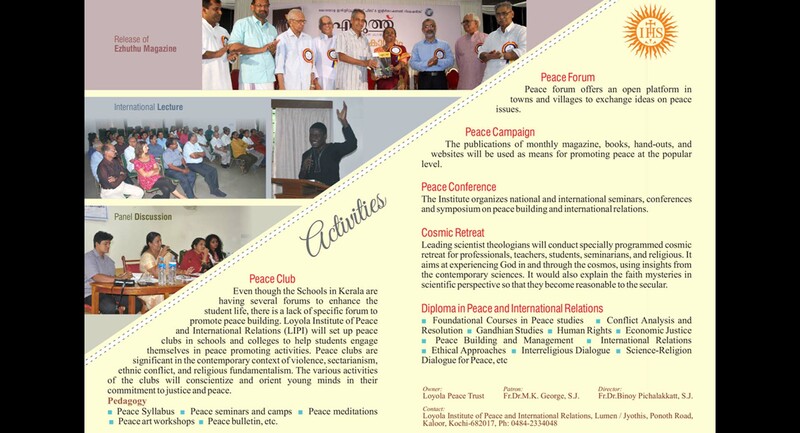 Thampy gave an orientation of the Institute an the new Magazine and placed it in the current context of Kerala and the unique role it will play in fostering harmony and peace. Fr Dr.M.K. George S.J., in his Presidential Address, stressed the fact that this institute keeps up the great legacy of the Jesuit tradition in terms of its vision and mission. Justice Kurien Joseph in his inaugural Address wished that an institute of this sort guided by Jesuits should play a counter-cultural role in promoting peace and justice. This is all the more significant at a time when we live in a context of fanaticism, fundamentalism, sectarianism and violence.